I, through my firm, was a customer of PFG, the latest registered broker dealer to steal from its clients’ accounts – first reports indicate $200 million may have been taken. This pattern is becoming too frequent. Innocent victims have lost money yet again. How did it come to this? Self-regulation by an oligopoly… I don’t think there is any economist or politician who wanted this outcome, but special interests and lobbying have led to this. This is how the futures industry works today. Capitalism is broken without fair rule of law and regulation, and today top firms organize and self-regulate with practices that add cost but lack teeth. This discourages competition from smaller companies, but it also gives the largest companies free reign to raid their clients’ accounts and hide their crimes for years. So far it seems there is little or no accountability when they are discovered. If market participants cannot expect basic protections, then they will leave, prices will fall, volume will shrink, and markets will whither. Companies will have less access to capital and be exposed to more risk, and the economy and workers will suffer. We’re already a long way down this path. The economic ideal and the allure of free markets is only possible when regulation protects innocent market participants, minimizes fraud and cheating, and does not deter innovation. That means expanded domain of the SIPC, the SEC should have unlimited authority to monitor accounts and communication (opt-in would be fine), and companies should only minimally participate in their own oversight. With this structure, investors would be protected, transparency would reduce fraud, and free markets could flourish with competition and innovation. Sounds obvious, but don’t hold your breath. There are a lot of types of corporate corruption, but they all start from an imbalance in power and oversight. There is one tiny change could have a huge impact on this problem: allow shareholders to nominate people for elections of the Board of Directors of public companies. It’s a small, seemingly obvious shareholder right, but it would have a big impact. Management should not have the exclusive right to nominate their bosses. In fact, because the Board of Directors is supposed to represent the owners’ interest, it seems crazy that owners can not nominate. When the owners of a company are empowered to nominate Board members, management comes back under control, compensation comes back to reality, performance is scrutinized better, and the interests of investors are better served. In private equity and smaller firms of every kind, this is always how it has worked. Major shareholders often join Boards of private companies and nominate other Board members. How public companies ever achieved the ability to control the Board nominations without rights for shareholders, I’ll never understand. There are so many other ways that markets are broken and corruption is bringing us down. Is it too much to fix? Are we destined to watch for the rest of our lives as the emerging markets grow right past us and Americans fight amongst ourselves? Is our political and influence machinery too dogmatic or corrupt to embrace new good ideas together? I finally got some sleep last night. 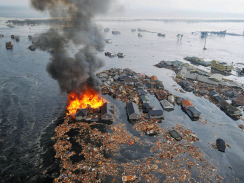 A week of stress and conflict, topped off with a terrible earthquake and tsunami in Japan. In my dream I was in a meeting, talking to friends in a very tall glass tower. I was standing by the wall of windows and looking out over the seacoast skyline. In the distance a big wave forms like a lump in the sea. It is moving toward us. The shore recedes, rolling back into the ocean. My breath stops. My hands on the glass. The wave comes in fast and high. It climbs up, out the of sea and starts to form a crest. I feel like we’re hundreds of feet in the air, but the wave is breaking just beneath us. I don’t feel a thing. The building doesn’t move at all. I watch other buildings wiped away. A mess of lumber and cars and buildings and people floats along as the water continues to push through the city. Small fires ignite and send up little tufts of smoke that must be hundreds of feet across when you get close. I was still. The building was still. Nobody said anything. I woke up. Maybe if I go back to sleep it will be different. The theory of Communism failed because it did not account for laziness. The theory of Capitalism will fail if it does not account for deceit. Just as Capitalism targeted laziness and succeeded while Communism failed, laws and a social contract must target deceit for Capitalism to work. The past month has been a roller-coaster in the financial markets. At the first hints of falling prices in the mortgage backed securities markets, Bear Sterns announced the bankruptcy of two large hedge funds, and 90% losses in a third fund which had $850 million invested in highly rated mortgage-backed securities. In the following weeks, other major funds also announced losses. Goldman Sachs’ Global Alpha hedge fund fell 27% this year through Aug. 13, prompting clients to ask for $1.6 billion in redemptions, investors told Bloomberg. DE Shaw, a pioneer of quantitative investing based on complex mathematical and computer techniques, has been hit hard in August. DE Shaw’s Valence fund is down more than 20% through August 24th, according to a fund of hedge fund manager. These high-profile losses are prompting redemptions, and as cash flows out of hedge funds, managers must sell. Around the world, leveraged funds anticipate redemptions and are deleveraging (selling). Because the markets for mortgage-backed securities dried up so completely and so quickly, managers began selling positions that remained liquid and well-priced. In a sense, they had to sell good investments because they couldn’t sell the bad ones. What started as a series of collapsing mortgage strategies has spread into just about every other market that hedge funds touch. Prices fell in investments ranging from emerging market bonds to the price of hogs. In all, more than $1 trillion in value has been lost in US stock markets, alone. Many foreign markets and alternative asset classes suffered worse declines. The trigger event is a credit tightening: mortgage issuers extended too much credit, were too loose with their lending standards, and may not have adequately communicated their loan terms. In response, lending standards have been increased and credit is tighter. US consumers might slow their spending, which might trigger a broader slowdown in the US economy, which might have implications for global growth. Uncertainty and fear prevail. We view this fear as primarily psychological, wildly overestimated, and only loosely related to market fundamentals (See Figure 1). But that may not matter. The pricing of risk is driven by psychology. Investors require compensation for the possibility of loss and also for the inconvenience of uncertainty. So rising risk can cause capital to become scarce, lending rates to go up, and spending to slow. In this sense, the psychology can impact the fundamentals in what is sometimes called a “contagion”. The “Greenspan put” was like a safety net, providing the comfort that credit would be made available on those occasions when it was needed. Bernanke has reiterated this strategy, but it remains to be seen if he has the same appreciation for what Keynes called the “animal spirits” of the market. Contagion is a real phenomenon, generally starting with a crisis in one market or a large fund, then spreading to other asset classes as volatility rises and investors require higher premiums for risky investments. Rising rates and tightening lending standards leads to a contraction in home prices, reducing consumer spending and slowing economic growth. A new awareness for the risk of debt investments causes borrowing costs for corporations and governments to rise, reducing investment and slowing economic growth. These risks can be self-reinforcing, and could change the fundamental characteristics of the economy. These are the type of events that could change our investment strategies if they appear to develop out of control. So far, these contagions have not caused a significant slowdown in economic activity. Volatility triggered by major hedge fund failures is different; it generally causes sharp declines in recently popular asset classes followed by recovery. These declines can proceed in unexpected ways, and can continue for some time because each price shock runs the risk of triggering another failure. It is surprising how many hedge funds use leverage sufficient to make them incompatible with price shocks. As months pass, however, these shocks can be a blessing because they offer rare value opportunities. We should all hope that a full-fledged contagion does not develop, and be thankful that the world’s central banks are standing guard. It is important for the government to intervene if a contagion might damage the economy in fundamental ways, but also important for the government to avoid interfering otherwise. The Federal Reserve and foreign central banks play an important role in managing the stability of economic growth by changing the availability of capital at money-center banks, but interventions can also cause distortions in currency exchange rates, changes in the money supply affect inflation expectations, and reliance upon government intervention can lead investors take excessive risks. On the 17th, the Federal Reserve followed several foreign central banks (European Central Bank, Australia, Japan, and others) by pumping capital into their nations’ banking systems in response to the recent volatility. This intervention increases the monetary supply, but the psychology of selling is still driving down many market prices as global investors reduce their exposure to risk and shift their portfolios to hold more cash and US Treasury Bonds. Credit tightening is a reasonable response to excessive lending, but the signal from global central banks is that they are ready to smooth the volatility, even if it means increasing the money supply. This indicates that they may intend to inflate their way out of potential economic pain. As a result, we are less concerned about a recession, but our long-term expectations for inflation have risen. This combination makes stocks and real assets more attractive because they are better hedges against inflation, and reduces the value of fixed income instruments (such as US Treasury Bonds). Meanwhile, the global investor crowd has been doing the opposite. If higher inflation will be the ultimate outcome of this recent roller coaster, then the massive global shift toward cash and fixed income may ultimately be reversed. The Dow Jones Industrial Average is hitting new all-time highs while crude oil is making new lows for the year. Moving in opposite directions is normal for these markets, but recent movements may come as somewhat of a surprise against a backdrop in which core inflation has risen to levels not seen in a decade and the yield curve is inverted. China and India seem to be in a race to secure energy reserves in anticipation that within three years, Asia’s oil consumption will surpass North America’s. Global economic production is expanding by about 4%, about double the average rate of the last 50 years. Growth rates are highest in the countries with the largest populations, and consumption is being subsidized by growing global debt markets. Stock valuations anticipate strong growth while commodity prices anticipate adequate supplies. This is an intellectual error. For major world markets to continue recent growth rates, many major supply-related hurdles would have to be overcome. Current capacity for energy supplies are insufficient to support more than a few years of continued growth at this rate; additional capacity will have to be created. However, whether or not one believes in the “peak oil” theory or not, it is indisputable that known oil reserves are shrinking while discoveries are taking longer and yielding less. While the pendulum of stocks and commodities has swung toward stocks, the fundamentals seem set up to push the pendulum back the other way. Commodities often move in the opposite direction from stocks over periods of three months or longer. Over longer periods, this negative correlation becomes quite strong; as much as -42% for five-year periods. The result is that these two asset classes have provided strong diversification benefits when combined in a portfolio. Their risks offset each other to a high degree, resulting in more consistent wealth accumulation. stocks, and much better than bonds. introduction of commodity futures while having a very small impact on returns. Risk-averse investors who are sensitive to maintaining their purchasing power should consider commodity futures as a component of their portfolios. The risk to the value of the U.S. dollar should not be overlooked. Many countries own substantial foreign reserves in U.S. dollar denominated debt. If these countries decided to diversify into a broader basket of currencies or assets, the outflow of capital would put pressure on the value of the U.S dollar. Commodities provide a hedge against volatility in the value of the dollar by maintaining purchasing power. World population is rising at a rate of about 1.3% per annum, or about 10,000 new people every hour. At the same time, productivity in the U.S. is rising at about 2.6% annually. The U.S. has very high productivity relative to other countries, and it is growing. At the same time, the vast majority of the world population lives in countries where productivity is much lower – but catching up. The process of productivity convergence has been dramatically accelerated by the opening of trade, reforms toward capitalism, and the growth of the internet to share information. The long-term trajectory is for developing countries to grow toward U.S. productivity levels. This simple dynamic has some profound implications: we’re not ready. If Chinese productivity rises to even half of U.S. levels, that economy’s GDP will expand from less than one fifth that of the U.S. to more than double that of the U.S.
a. World population suddenly stops growing. b. The U.S. never innovates, and simply maintains existing productivity levels. c. Other countries catch up to U.S. productivity levels in 50 years. a. China would average 6.6% growth for 50 years, raising its production by more than 24 times to more than four times the size of the U.S.
b. India would average 8.5% growth for 50 years, raising its production by almost 60 times to more than three times the size of the U.S.
c. Global production would rise by more than 5 times. a. World population continues to grow at 1.3%. b. U.S. productivity continues to grow at 2.6%. a. China would average 10.8% growth for 50 years, raising its production by more than 169 times, to more than 30 times the current output of the U.S.
b. India would average 12.8% growth for 50 years, raising its production by more than 410 times, to more than 25 times the current output of the U.S.
c. Global production would rise by more than 41 times. These long-standing and slow-moving global economic trends will almost certainly be interrupted by commodity shortages during this period. Even the most optimistic forecasts for natural resource capacity do not anticipate supporting even the conservative scenario for growth. We expect that as population and productivity trends push demand higher, commodity prices will rise to keep demand lower. Equilibrium prices are likely to be driven increasingly by production capacity as shortages develop. Over time, this will likely slow global growth rates and provide advantages to companies and countries that are net suppliers. “The Century of the Self” is a documentary from the BBC which discusses how groups behave, and why. The psychology of individuals has implications when studying populations. Understanding the dynamics of groups has been used to engineer demand and consent for products and political views. This is a very interesting documentary, with detailed historical references. Problem: The US has lost some of its competitive advantage with companies in other countries. A major part of this problem is the differences in economic policy and labor standards that prevail in various countries. Solution: Set specific global Tariff Triggers. For example: 5% on countries that peg their currency, 10% on countries that allow child labor, 10% on countries that outlaw organized labor, etc. These numbers are just examples. The triggers should be set to offset some of the unfair competitive disadvantage. Benefits: US workers will be competing more fairly with international competitors. Some foreign countries will improve their labor standards in order to avoid tariffs on their exports. In those cases, US workers will benefit because the foreign competition will have have to operate under similar rules as US companies. Some foreign countries will not change their labor standards or economic policies, so they will trigger the tariff. This will also protect US workers from those unfair practices (to some degree) because import tariffs drive up the prices of those specific competing imports.